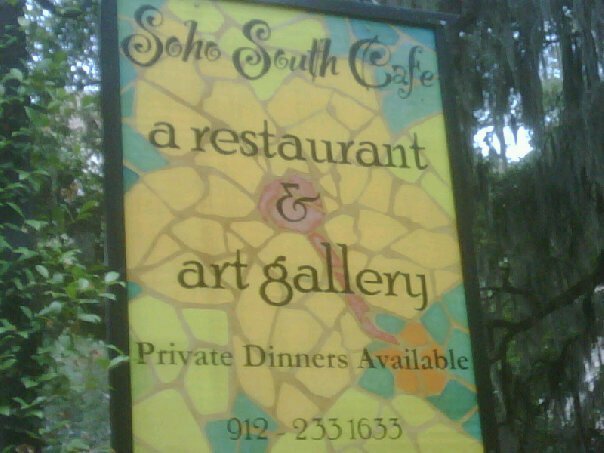 Kayla went to brunch at Soho South Cafe in downtown Savannah a few weeks ago and has raved about their Monte Cristo sandwich ever since. 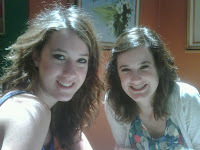 The three of us went for Hannah's birthday lunch, where they each ordered their own. 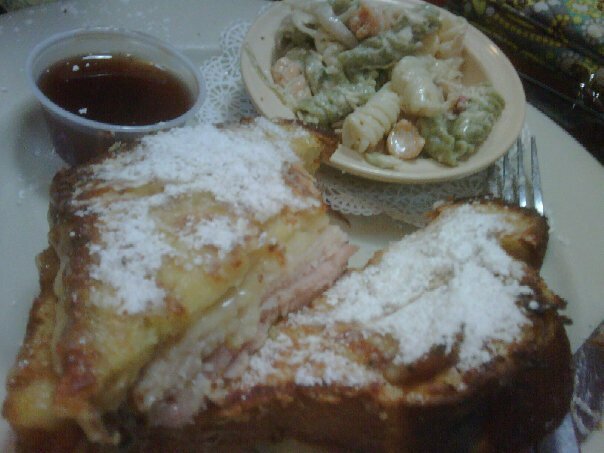 The traditional Monte Cristo is usually turkey, ham and cheese on bread which is dipped in batter, then deep fried. Let me just say... bleh! I'm not a fan. At Soho, they make French Toast, then create the griddled sandwich. The result is nice and crispy, not fried and greasy. The Soho team is very creative and comes up with twists on traditional stuff. 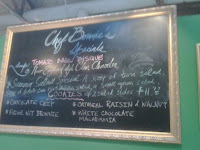 Their version of grilled cheese and tomato soup makes me want to sing, but everyone will be extremely glad that I don't. 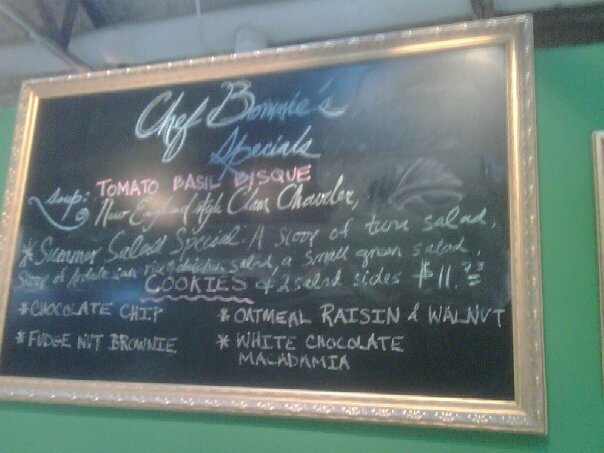 This is the menu description: Modern Grilled Cheese and Tomato Soup Combo: smoked gouda, cheddar, gruyere, and pimiento aioli on sourdough bread with a bowl of our famous tomato basil bisque. It is heavenly... you've got to try it! 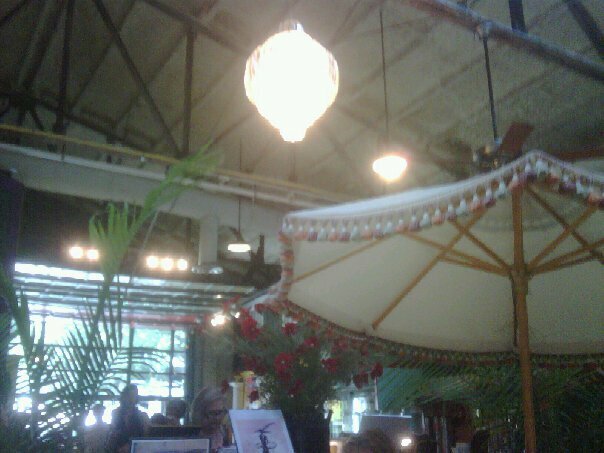 I love the atmosphere as much as the food. It is visual stimulation at its best. Whether you're sitting at a garden table under a tasseled umbrella or dining in the cozy library surrounded by books, original art catches your eye at every glance. The decor is mismatched, colorful and eclectic... my type of place! 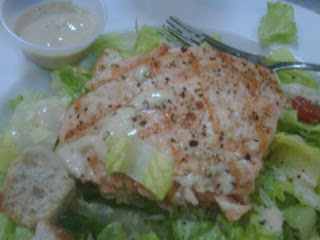 On this particular day, I ordered the Caesar Salad topped with Grilled Salmon. The dressing is housemade... garlicky, anchovy goodness! The salad was light and crisp, the fish tender and full of flavor. We were all so satisfied that we didn't order dessert... but there's always next time!